TUESDAY, Nov. 17, 2015 (HealthDay News) -- Quickly clobbering a cold with a certain antibiotic might help kids who are prone to severe respiratory tract infections, a new study suggests. Doctors generally are advised not to prescribe antibiotics for routine viruses like the common cold. But for especially vulnerable children, one antibiotic in particular -- azithromycin -- might thwart more serious illness, researchers said. As many as one-quarter of preschoolers suffer from recurrent wheezing in their first 6 years of life, according to background information in the new report. "These kids are basically fine until they get a cold, and then every time they get a cold it goes into their chest and causes wheezing," said Dr. Robyn Cohen, an assistant professor of pediatrics at Boston University School of Medicine. Researchers have found they can knock out a cold bug before it progresses to a more serious respiratory illness by giving kids an early, heavy dose of azithromycin, according to findings published Nov. 17 in the Journal of the American Medical Association. Azithromycin has been shown to help reduce inflammation and kill viruses, Cohen said. "That makes it particularly appealing as a potential therapy for wheezing," she said. It's important to try to prevent these wheezing episodes from occurring in the first place, said lead author Dr. Leonard Bacharier, clinical director of allergy, immunology and pulmonary medicine at Washington University School of Medicine in St. Louis. Kids who received the maximum dose of azithromycin at the first sign of a cold had a 36 percent lower risk of progressing to a severe lower respiratory tract illness, compared to kids treated with an inactive placebo, the study results showed. Doctors often treat repeated respiratory illnesses with corticosteroids, such as prednisone, intended to help open up the airways. But these steroid drugs have not been shown to help much, Bacharier said. "We let them get sick, and then we give them a therapy that's not predictably effective in them," he said. Antibiotics are used to treat some cases, but they normally aren't deployed until the child is either very ill or has been wheezing for days on end, Bacharier explained. To see if using an antibiotic earlier would benefit these kids, Bacharier and his colleagues randomly assigned 607 children with a history of respiratory illness to receive either azithromycin or a placebo as soon as they displayed cold symptoms. The kids who got azithromycin -- known to many by the brand names Zithromax and Zmax -- received the highest U.S. Food and Drug Administration-approved dose for treating infections, the researchers said. 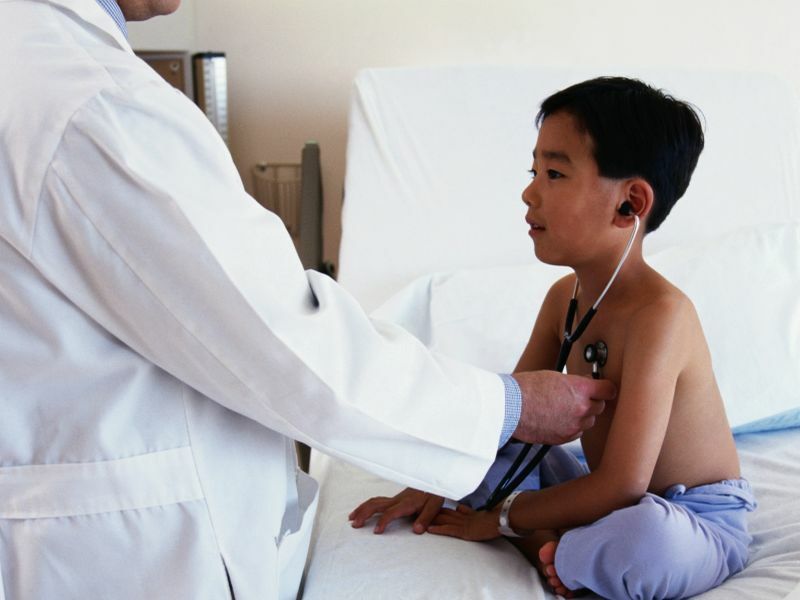 The researchers treated 937 respiratory tract illnesses in 443 kids. Both groups had equal numbers of respiratory infections, but there was a significant difference in how far their infections progressed, the study authors said. Of 92 observed cases of severe respiratory illness, only 35 occurred in the azithromycin group compared with 57 in the placebo group, the investigators found. Cost and safety are not substantial barriers to this approach, Bacharier said. Azithromycin is generic, and is considered very safe. "It's an inexpensive and widely available therapy around the world, with minimal side effects," he said. But Cohen, co-author of an accompanying journal editorial, said it will be tough for pediatricians to draw any general lessons because the researchers applied very narrow and specific guidelines to the kids included in the study. "I think this research is promising, but more research needs to be done about which children in particular would benefit from getting this antibiotic for their colds," she said. Antibiotic resistance is another concern. The U.S. government has stepped up efforts to limit use of antibiotics, to make sure germs don't develop an immunity to them and become difficult to treat. "Azithromycin is well-known to cause antibiotic resistance," Cohen said. "Overuse can introduce an azithromycin-resistant organism into the general population." In this study, researchers found azithromycin-resistant bacteria both in kids who were and kids who were not treated with the antibiotic. "We know children share these organisms with other children," Bacharier said, noting that kids who received antibiotic treatment were slightly more likely to wind up with resistant bacteria in their throats. Future research will be needed to figure out what that means for the children, Bacharier said. "We don't know how long [that resistant organism] does or does not stick around," he added. "Are those children at greater risk of having more infections down the road? We just don't know."